Observed in a pasture area near Eldoret, Kenya. January 2012. I am reasonable certain ot this plant's identification. 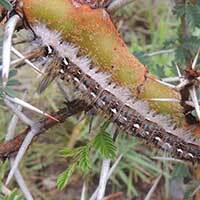 Some authorities have moved this and related acacias to Vachellia. The developing seed pods play host to one or more species of gall-causing insects. The swollen pod segments may be strangely hirsute or else bright red and are probably caused by the larvae of chalcidoid wasps less than 2 mm long. On a future trip I hope to collect some galls and examine the emerging insects. Eldoret, December 2012. The larvae of several Lepidoptera (butterflies and Moths) may be encountered eating the leaves. A type of tussuck moth larva is shown below. Follow thumb-link for more information about this associate of Acacia seyal. FLOWERS: Yellow-orange flowers small and densely packed into spherical clusters. Color is from the stamen filaments. 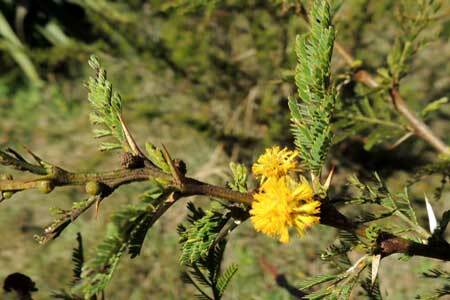 SHRUB or TREE: Scrubby plant on rangeland. 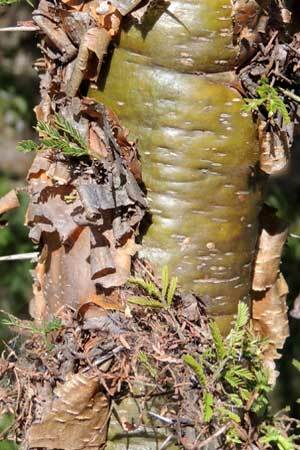 Typically trees have reddish, powdery bark, but some varieties have greenish-yellow and peeling bark bark. This was once used to distinguish A. hockii from A. seyal. Left undisturbed it reaches tree size. LEAVES: Leaves are twice compound with the ultimate segments quite small so the leaves appear feathery. RANGE: This plant is native, but because it is resistant to cattle and goats it is often abundant in poorly managed pastures. Found at mid elevations up to 2000m. 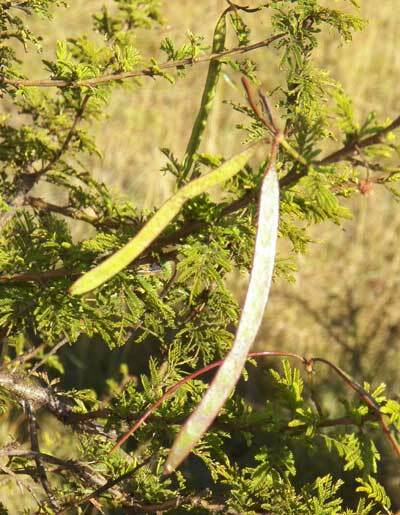 FRUIT: The bean pods are slender and flattened. 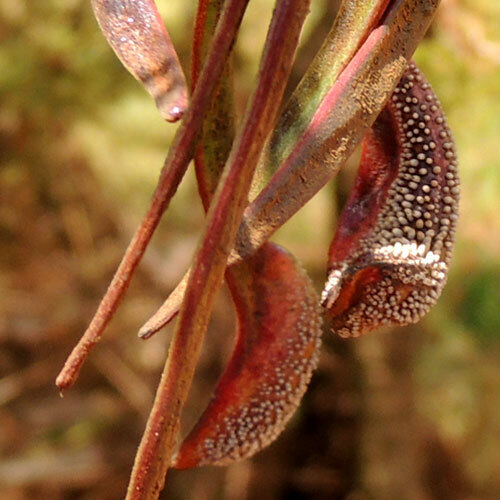 The seeds remain attached to the pods by slender threads for a while after it splits opens. ARMED. The paired, straight spines are variable in length and typically gray to white in color. 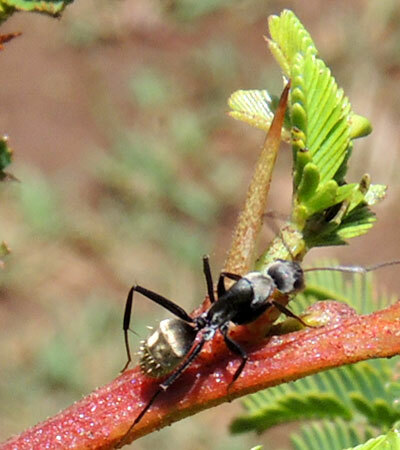 Ants, such as the Carpenter Ant above, play a role in this and other acacias dominance on overgrazed pastures. The ants get sweet sustanence from glands on new buds and help defend the plant from herbivorous insects.